“Why should we believe the Bible? Why is it any different from all the other religious books? 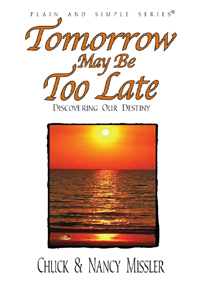 In just a little over a hundred pages, Tomorrow May Be Too Late relates man’s spiritual journey from the beginning of time to the very end, showing how God has been personally and intimately involved all along. The Bible: Why Should We Believe It? After the funeral, I drove to a local Christian bookstore . I was hoping to find a little book I could give to the family members that would simply answer three basic questions: What’s our purpose in life? In whom can we reliable trust? and, is there a future hope? I could not find such a book! There seemed to be plenty of large, thick books, as well as small tracts on how to be saved, but no small, understandable books. Learn more about Tomorrow May Be Too Late with these supporting materials.